Infuse your prom tuxedos with stylish inspiration! When it comes to prom, everyone likes to wear their finest formal wear and look the sharpest with the perfect tux or dress, shoes and hair on the big night. Every so often we focus on the attire for ladies but this time we are going to shift our attention to prom attire for our dudes. I curated a style guide for tuxedos in which our prom kings can draw inspiration from so they can make their grand entrance, marked the best dressed man in the room. Check out this red hot tuxedo! Styled in a three piece layering set; slim tie, a black satin vest and a statement red jacket with matching red trousers that will grab the attention of others. This tuxedo will make a guy perfectly sleek for the prom. If you are not a “bowtie” type of guy, you can always opt for the choice of a long one. Also styled in a three piece layered set, this tuxedo factors in sophistication and refinement, a look for the man who likes to shine in mere opulence. Don’t shy away from wearing something loud and bold to the prom. Take your look to the next level by playing around with prints and patterns. Not only do they give your tuxedo a pop but also adds some personality to your look. It’s time to take off those ties and rock a more laid back look. A nice white and slate grey color combo with crisp slim fit pants sparks a comfortable poise while still be unconventionally appropriate for any prom’s date. The good ol’ classic black and white attire. Undeniably conservative and sophisticated, this look never goes out of style. 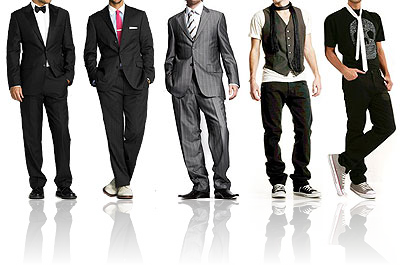 For the Nistos who prefer a more traditional look, make sure to opt for a pair slim fit pants for that modern twist. Let’s take it back old school! Perhaps the waist band isn’t what most guys’ would prefer when it comes to prom tuxedos but there are some who do enjoy the good old school flare with a modern twist. To pull of this look off, make sure to wear a bowtie, a white or soft pastel color shirt and don’t forget to embrace that lovely waist band that we all adore. When in doubt, go monochrome. Not only is it easy to suit up in, you can never go wrong in white or black for that matter. Guys will look irresistibly fresh, clean and sharp in a monochromatic white and while you’re at it, it’s ok to throw on a fresh pair of white kicks. It will only further your “cool” factor. Didn’t I just say “monochrome”? Black is a timeless color and never goes out of style. But the most daring thing when it comes to tuxedos, is going completely black. Since we wouldn’t want our men to come out looking dull, look for pieces that can be accented and provide your look with a shimmer. Such as the tie, vest or shirt and jacket trimmings. Before you know it, you will forget you were even wearing all black.